New Quilt Kits and Snow??? "April Showers Bring....SNOW." - YUCK!! We've been busy packing, unpacking, repacking & racking up the miles on the ol Block Party van! Since our last newsletter we've been to Pigeon Forge, TN, Denver, CO, Chicago, IL, and will have be just home from Paducah, KY by the time you read this! Thank you, Thank you, Thank you, to all how made them really great, some record breaking shows! Thank you especially to everyone in Pigeon Forge & Denver for making us feel so welcome during our first time showing both places! Well, I'm disappointed to say, unfortunately we will not be at this years Spring Market, due to the fact it's in Oregon this year & our busy travel schedule so full we wouldn't have time for the drive there. ALTHOUGH, we will still have a new spring line-up as usual!! I'm sworn to secrecy like usual but I can give you a small glimpse & a hint. First, we have a new pattern for a panel we've printed for years, all of you Grandparents out there have been asking for it....that's right! Next up; Ames, Iowa! We'll make the 5 mile trek over to Ames for the "Central Iowa Quilters One-Stop Shopping Spree April 27 &28th! 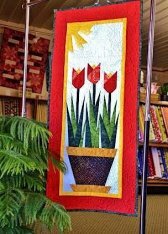 Then it's on to Sandy, UT for the "Utah Quilting & Sewing Marketplace May 3rd - 5th. hope to see you at either! SEW - until we meet again, keep those creative juices flowing & think spring for all of us here in the snow!